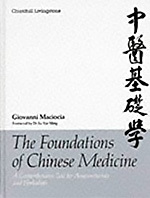 This comprehensive and scholarly work presents an explanation of the theories of Chinese Medicine in relation to clinical practice, as well as information on creative adaptation of Chinese Medicine theory to Western clinical conditions. The author combines scholarship with a readable style and well-structured content that can be read through or used as an easy clinical reference. By including the clinical use of over 200 acupuncture points and discussing many previously neglected aspects of Chinese Medicine, this is the most-detailed and comprehensive textbook of Chinese Medicine available in English.